Similar to other analysis and detection instruments, the toxic and harmful gas detectors complete the measurement with relative comparison method: firstly, a zero gas and a standard concentration gas is used to calibrate the instrument, then a standard curve is obtained to be stored in the instrument. When measuring, the instrument compares the electrical signals produced by the detected gas concentration to the electrical signals of the standard concentration, and then calculates the accurate gas concentration value. Therefore, zero-calibration shall be carried out to the instrument at any time, and regular calibration of instrument is necessary to ensure the accuracy of instrument measurement. It needs to be explained that: many gas detectors can replace detection sensors at present, but it does not mean that a detector can be equipped with different detector probes at any time. Whenever the probe is replaced, the instrument must be calibrated again besides the activation time of sensor. Moreover, it is suggested that the instrument should be conducted with response test by standard gas before using, so as to ensure that the instrument really plays a protective role. Generally, each sensor corresponds to a specific detection gas, but no gas detector can be absolutely special. 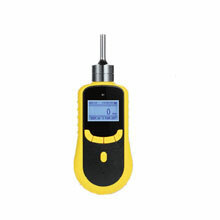 Therefore when choosing a gas sensor, we should know as much as possible the detection interference of other gases to the sensor, so as to ensure its accurate detection of specific gases. All kinds of toxic and harmful gas detectors have their fixed detection range, and they can make accurate measurement only in the measurement range. If the sensor is measured beyond its measurement range for a long term, permanent damage may be caused to the sensor. For example, if the LEL detector is used carelessly in the environment of more than 100% LEL, the sensor may be completely burn. Toxic gas detectors may also be damaged if they work for a long time at a higher concentration. Therefore, if a fixed instrument sends out an over-limit signal in use, the measuring circuit should be switched off immediately to ensure the safety of the sensor.